Quinoa Tabouli ... Taboulleh ... Tabbouli ... Which Do You Use? Diane’s Friday Foodie Fix for this week inspired me to make a dish I’ve always thought about making—a tabouli made using quinoa instead of bulgur wheat. Yikes, bulgur wheat … not something those of us who are gluten free want to eat. But, quinoa, on the other hand is gluten free, and it’s a nutritional powerhouse. The packaging of the Ancient Harvest Quinoa that I use states that it’s “one of the best sources of protein in the vegetable kingdom” according to the National Academy of Sciences. It provides all the essential amino acids. You can read more about quinoa’s wonderful benefits here. Diane also talks about quinoa’s redeeming qualities and shares not one, but five, of her recipes using quinoa (from salads to desserts). Based on past Friday Foodie Fix events, at least a dozen more great quinoa recipes will be added by other talented bloggers and readers before this weekend is over. So keep checking back at her W.H.O.L.E. Gang site. Tabouli (also spelled tabbouleh or tabouleh) is a Middle Eastern dish. Wikipedia says it’s a Levantine Arab dish and cites the typical ingredients as bulgur wheat, mint, parsley, tomato, scallion, herbs, lemon juice, olive oil, and seasonings. Sometimes, so much parsley and mint is used in tabouli that the dish looks very green, but most tabouli I’ve seen looks more like a rice pilaf dish. That’s the look I decided to go for with my version of tabouli. What could I substitute for the mint to get a similar effect with my tabouli? Well, in last week’s shopping trip, I picked up some cilantro to make Melissa’s Spicy Squash Salad. (I had planned to make Melissa’s wonderful salad for our support group meeting, but, alas, I ran out of time before the meeting. So, the butternut squash remains on the counter, as well as the Fuji apples … hopefully, I’ll make the salad this weekend—once I’m done helping my son with his apartment move.) So, I decided to use cilantro in place of the mint. I enjoy dishes with cilantro—when just the right amount is used; otherwise, I find it overpowering. But, used properly, cilantro adds a very nice freshness with its citrus-like taste. We were having tacos last night, so after I cooked the quinoa I added most of the ingredients I had prepared for the tacos: red pepper, yellow pepper, green pepper, and sweet onion. I skipped the lettuce (Iceberg … hubby’s thing), mushrooms, and cheddar cheese, but I had some broccoli I’d lightly steamed, so I added some of that as well. Of course, garlic was a requirement; I added a clove of garlic (maybe more), minced. I wanted to add some chopped cucumber, but my cucumber was well past its prime … next time on the cucumber. You can eat the tabouli while your quinoa is still hot, right after you’ve added the other ingredients, or you can eat it cold. (Some say that quinoa tastes better after you let it “rest.”) Because we were having tacos, I placed a little taco meat* in the taco shell and then filled it with the tabouli. This tabouli taco was unbelievably good. My usual tacos include cheddar cheese, but I didn’t miss that at all. I ate two tacos! But, they were probably the best and healthiest tacos I’ve ever eaten! If you are using your quinoa tabouli as more of a cold salad, you can opt for a dressing of some type. It doesn’t have to be anything hard to make—perhaps a mixture of lemon juice, olive oil, and seasonings; or just squeeze some fresh lemon juice or drizzle a little olive oil over your tabouli. My friends, Pete and Kelli, of No Gluten, No Problem shared the basics on a quinoa salad they first enjoyed in Bolivia with another classic, easy dressing. Again, very simple, but delicious—and, naturally gluten free. If you’ve never had quinoa before, give it a try in this tabouli dish. I think you’ll love it! If you’re already a big quinoa and tabouli fan, please share your favorite way to prepare it. *We use ground venison and the recipe from the Betty Crocker cookbook for seasoning … no packaged mixes required with their additives and preservatives. 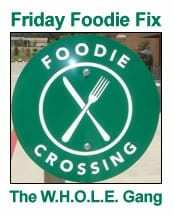 This post is also linked to Friday Foodie Fix–Balsamic Vinegar, Grillin’ and Chillin’, Whole Food Friday, and Wellness Weekend. Yum. My kind of recipe–it should look “right.” That’s how I measure. I’ve never had Tabouli, wheat-laden or otherwise, but this looks really good =D. Hey, Lauren–Happy Saturday! If you like mint, you might want to try a quinoa tabouli made with that first. Or, you could split your batch of quinoa and put mint in half and cilantro in half. I like doing taste test comparisons. 🙂 Let us know if you try either or both, please! Very creative way to make tabouli. You always surprise me with your recipes. I love that! Thank you for sharing this on Friday Foodie Fix. Diane–I can’t believe I’m surprising you of all people. You have some of the most creative recipes around, but I’ll take that as a compliment and keep doing my best. 😉 The FFF is such a fun event … so many wonderful recipes from terrific folks! Thanks so much for hosting the event each week–that’s quite a commitment and we appreciate it! Hi, CeliacsTips!–Welcome to gfe! It’s fun to learn new recipes and make them up as one goes. If I hadn’t had broccoli, I might have tried fresh corn or whatever else I had on hand and ready to go. This recipe could be something slightly different each time. Last night, I actually added a little of the taco meat to it, some gf soy sauce, and heated it a bit—making a stir-fry type dish. It was great, too. I like dishes that re-invent themselves easily for leftovers as it’s just hubby and me at home and we don’t want to eat the same thing repeatedly. I made something similar to this, yet different. I love how many variations on one dish we the people come up with. Yours look very yummy. Good morning, Rachel!–I took a quick look at your recipe and it does look very similar … great minds and all that! 😉 But, different, too … this dish can take on so many variations like you said. I like to get input from hubby or son (when he’s home from college), too, sometimes about what I should add. You had me at quinoa. Love that stuff!! Where in the world did you find guar-gum free coconut milk?! I MUST find that! What brand? Have a great weekend Shirley, xoxo! Hi, CoconutGal–Happy Saturday! Love them … and we get to eat steamed crabs later today for BIL’s BD–yummy! Quinoa is so good … I would never have discovered it if I hadn’t gone gluten free! The coconut milk is Ty-Ling. I bought it at my uh “minimal” Food Lion the other day. Who’d have thunk it? 😉 BUT, when I returned, I just grabbed the can of coconut milk and when I got home, it was Thai Kitchen, which does contain guar gum. So I may never see the Ty-Ling brand again! (That happens at Food Lion all the time.) I could not find a photo of it online, but here’s a link for the coconut milk that shows a few of their other canned products so you can see what their labeling looks like. xo and great weekend wishes to you, too, dear! This looks fabulous, love the bursts of bright color. I’ll have to try it next time. Thanks! Hi, Heather–Thanks so much!! I’m enjoying a scrambled egg with those same bursts of color as we speak. Delish! Wow, Shirley! This looks amazing! Had quinoa for the first time this week – pretty plain though. (I had only used the flour before) Will have to spruce it up a bit now that I have this recipe! If I ate the quinoa warm, I think I would want the veggies cooked. I like the idea of having it cold with some type of dressing. Sort of like a pasta salad but with quinoa. Thanks for the ideas. I love quinoa, my kids eat it for breakfast with beans. I usually make a quinoa tabouli in the summer when our cherry tomatoes and cucumbers are bountiful. I will make a dressing of fresh mint, olive oil, lemon, garlic, and sea salt and toss the quinoa with the cucumber and tomatoes and maybe some green onions and parsley. Quinoa is so versatile – there are just endless possibilities. Your recipe looks great and of course easy! GFE! Mmmmmm…cilantro! This recipe would be good with couscous, too, I’ll bet. Is that a gf no-no? For you, perhaps not so good, but for me, a quick and easy tabbouleh copycat. I don’t really measure much either it’s ok 🙂 I love tabouli, and quinoa is perfect to make a gf substitution for it! 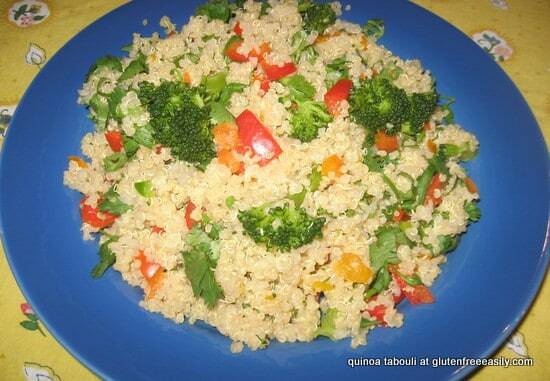 what a great idea to use quinoa instead of bulger wheat! thanks for posting!